Recipe for Strawberry Lemonade Layer Cake, a fresh tasting brightly colored spring dessert. 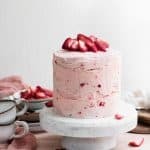 Zesty lemon cake with layers of strawberry buttercream frosting. Store in fridge for 2 weeks or cut slices, wrap in plastic wrap and freeze for up to 6 months. Grease three 6-inch round baking pans with baking spray or lay two thin strips in a plus sign pattern across pans letting excess overhang. This is my preferred method, so I can easily lift cakes from the pan after baking. Place butter, sugar, and lemon zest in bowl of stand mixer. With whisk attachment, whip until light and well mixed. Start on a low speed and then move to medium. You may need to stop a few times and with a soft spatula push butter chunks off the whisk and back into bowl. Also scrape around the edges and across the bottom once or twice to make sure everything is incorporated. In a separate bowl, hand whisk together flour, salt, and baking agents. Set aside. Add eggs to sugar and butter one at a time. Make sure each egg is throughly combined before adding lemon juice. The batter will start to resemble cottage cheese, but don't worry, all is well. Slowly spoon flour into mixture at low speed, adding almond milk in as you go. Stop half way to scrape the sides and bottom of the bowl. Once all ingredients are incorporated, turn to medium speed for 2-3 minutes. Divide the batter between the three pans. For this cake 1 1/2 to 1 2/3 cup of batter per pan should do the trick. Bake at 350 F for 30-35 minutes or until toothpick comes out clean after being inserted down the center. Clean and dry your stand mixer bowl and whisk attachment. Place room temp butter and 4 cups powdered sugar in bowl. Beat on medium until completely mixed and fluffy. Again, you may need to take spatula and scrape across sides and bottom. Add milk and chopped strawberries. The more strawberries you add, the pinker the color. You will have chunks of strawberries in your frosting, YUM!! Continue to add remaining 2 cups of powdered sugar slowly until frosting is thick but still spreadable. Cover bowl with plastic wrap and set aside. Now that your three cakes are cool, its time to level the tops for stacking. Remove from pans or peel off parchment paper. Take a serrated knife and gently cut dome from top of cake. Use other hand to stabilize the cake layer, to make sure its an even cut. Do this for all three layers. Now spoon your frosting into your piping bag. Cut the tip and pipe a small half dollar circle of frosting onto your cake dish/stand. Pipe and cover with frosting. Repeat with second layer. Add top layer trimmed side down. Cover with frosting. Pipe and smooth frosting around the sides of cake. Place in fridge to help set frosting for 30 min. Top with chopped strawberries and serve!! Tips: Set refrigerated butter on counter for 3hrs to reach room temp. Place cake rounds after cooling into freezer for 45 minutes, this makes applying frosting much easier.